In mathematics, trigonometric identities are equalities that involve trigonometric functions and are true for every value of the occurring variables where both sides of the equality are defined. Geometrically, these are identities involving certain functions of one or more angles. They are distinct from triangle identities, which are identities potentially involving angles but also involving side lengths or other lengths of a triangle. These identities are useful whenever expressions involving trigonometric functions need to be simplified. An important application is the integration of non-trigonometric functions: a common technique involves first using the substitution rule with a trigonometric function, and then simplifying the resulting integral with a trigonometric identity. Signs of trigonometric functions in each quadrant. The mnemonic "All Science Teachers (are) Crazy" lists the basic functions ('All', sin, tan, cos) which are positive from quadrants I to IV. This is a variation on the mnemonic "All Students Take Calculus". 1 full circle (turn) = 360 degree = 2π radian = 400 gon.
) for gradian, all values for angles in this article are assumed to be given in radian. are the only rational numbers that, taken in degrees, result in a rational sine-value for the corresponding angle within the first turn, which may account for their popularity in examples. The analogous condition for the unit radian requires that the argument divided by π is rational, and yields the solutions 0, π/6, π/2, 5π/6, π, 7π/6, 3π/2, 11π/6(, 2π). The functions sine, cosine and tangent of an angle are sometimes referred to as the primary or basic trigonometric functions. Their usual abbreviations are sin(θ), cos(θ) and tan(θ), respectively, where θ denotes the angle. The parentheses around the argument of the functions are often omitted, e.g., sin θ and cos θ, if an interpretation is unambiguously possible. The sine of an angle is defined, in the context of a right triangle, as the ratio of the length of the side that is opposite to the angle divided by the length of the longest side of the triangle (the hypotenuse). The cosine of an angle in this context is the ratio of the length of the side that is adjacent to the angle divided by the length of the hypotenuse. These definitions are sometimes referred to as ratio identities. where sin2 θ means (sin(θ))2 and cos2 θ means (cos(θ))2.
where the sign depends on the quadrant of θ. Each trigonometric function in terms of each of the other five. All of the trigonometric functions of an angle θ can be constructed geometrically in terms of a unit circle centered at O. Many of these terms are no longer in common use. The versine, coversine, haversine, and exsecant were used in navigation. For example, the haversine formula was used to calculate the distance between two points on a sphere. They are rarely used today. By examining the unit circle, the following properties of the trigonometric functions can be established. satisfy simple identities: either they are equal, or have opposite signs, or employ the complementary trigonometric function. By shifting round the arguments of trigonometric functions by certain angles, it is sometimes possible that changing the sign or applying complementary trigonometric functions express particular results more simply. Some examples of shifts are shown below in the table. A full turn, or 360°, or 2π radian does not change anything along the unit circle and makes up the smallest interval for which the trigonometric functions sin, cos, sec, and csc repeat their values, and is thus their period. Shifting arguments of any periodic function by any integer multiple of a full period preserves the function value of the unshifted argument. 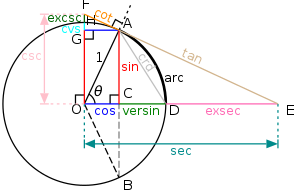 A half turn, or 180°, or π radian is the period of tan(x) = sin(x)/cos(x) and cot(x) = cos(x)/sin(x), as can be seen from these definitions and the period of the defining trigonometric functions. So shifting the arguments of tan(x) and cot(x) by any multiple of π, does not change their function values. For the functions sin, cos, sec, and csc with period 2π half a turn is half of their period. For this shift they change the sign of their values, as can be seen from the unit circle again. This new value repeats after any additional shift of 2π, so all together they change the sign for a shift by any odd multiple of π, i.e., by (2k + 1)⋅π, with k an arbitrary integer. Any even multiple of π is of course just a full period, and a backward shift by half a period is the same as a backward shift by one full period plus one shift forward by half a period. A quarter turn, or 90°, or π/2 radian is a half period shift for tan(x) and cot(x) with period π (180°), and yields the function value of applying the complementary function to the unshifted argument. By the argument above this also holds for a shift by any odd multiple (2k + 1)⋅π/2 of the half period. For the four other trigonometric functions a quarter turn also represents a quarter period. A shift by an arbitrary multiple of a quarter period, that is not covered by a multiple of half periods, can be decomposed in an integer multiple of periods, plus or minus one quarter period. The terms expressing these multiples are (4k ± 1)⋅π/2. The forward/backward shifts by one quarter period are reflected in the table below. Again, these shifts yield function values, employing the respective complementary function applied to the unshifted argument. Shifting the arguments of tan(x) and cot(x) by their quarter period (π/4) does not yield such simple results. Illustration of angle addition formulae for the sine and cosine. Emphasized segment is of unit length. These are also known as the angle addition and subtraction theorems (or formulae). The identities can be derived by combining right triangles such as in the adjacent diagram, or by considering the invariance of the length of a chord on a unit circle given a particular central angle. Furthermore, it is even possible to derive the identities using Euler's identity although this would be a more obscure approach given that complex numbers are used. Illustration of the angle addition formula for the tangent. Emphasized segments are of unit length. Relocating one of the named angles yields a variant of the diagram that demonstrates the angle difference formulae for sine and cosine. (The diagram admits further variants to accommodate angles and sums greater than a right angle.) 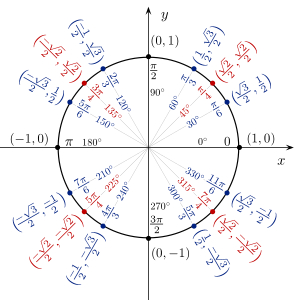 Dividing all elements of the diagram by cos α cos β provides yet another variant (shown) illustrating the angle sum formula for tangent. Illustration of the angle addition formula for the cotangent. Top right segment is of unit length. which is also the matrix transpose. These formulae show that these matrices form a representation of the rotation group in the plane (technically, the special orthogonal group SO(2)), since the composition law is fulfilled and inverses exist. Furthermore, matrix multiplication of the rotation matrix for an angle α with a column vector will rotate the column vector counterclockwise by the angle α.
. In particular, in these two identities an asymmetry appears that is not seen in the case of sums of finitely many angles: in each product, there are only finitely many sine factors but there are cofinitely many cosine factors. Terms with infinitely many sine factors would necessarily be equal to zero. When only finitely many of the angles θi are nonzero then only finitely many of the terms on the right side are nonzero because all but finitely many sine factors vanish. Furthermore, in each term all but finitely many of the cosine factors are unity. using the sine and cosine sum formulae above. The number of terms on the right side depends on the number of terms on the left side. and so on. The case of only finitely many terms can be proved by mathematical induction. where ek is the kth-degree elementary symmetric polynomial in the n variables xi = tan θi, i = 1, ..., n, and the number of terms in the denominator and the number of factors in the product in the numerator depend on the number of terms in the sum on the left. The case of only finitely many terms can be proved by mathematical induction on the number of such terms. These can be shown by using either the sum and difference identities or the multiple-angle formulae. The fact that the triple-angle formula for sine and cosine only involves powers of a single function allows one to relate the geometric problem of a compass and straightedge construction of angle trisection to the algebraic problem of solving a cubic equation, which allows one to prove that trisection is in general impossible using the given tools, by field theory. A formula for computing the trigonometric identities for the one-third angle exists, but it requires finding the zeroes of the cubic equation 4x3 − 3x + d = 0, where x is the value of the cosine function at the one-third angle and d is the known value of the cosine function at the full angle. However, the discriminant of this equation is positive, so this equation has three real roots (of which only one is the solution for the cosine of the one-third angle). None of these solutions is reducible to a real algebraic expression, as they use intermediate complex numbers under the cube roots. For specific multiples, these follow from the angle addition formulae, while the general formula was given by 16th-century French mathematician François Viète. for nonnegative values of k up through n.
The Chebyshev method is a recursive algorithm for finding the nth multiple angle formula knowing the (n − 1)th and (n − 2)th values. cos(nx) = 2 · cos x · cos((n − 1)x) − cos((n − 2)x). cos((n − 1)x − x) = cos((n − 1)x) cos x + sin((n − 1)x) sin x.
sin(nx) = 2 · cos x · sin((n − 1)x) − sin((n − 2)x). This can be proved by adding formulae for sin((n − 1)x + x) and sin((n − 1)x − x). Setting either α or β to 0 gives the usual tangent half-angle formulae. Obtained by solving the second and third versions of the cosine double-angle formula. and in general terms of powers of sin θ or cos θ the following is true, and can be deduced using De Moivre's formula, Euler's formula and the binomial theorem. The product-to-sum identities or prosthaphaeresis formulae can be proven by expanding their right-hand sides using the angle addition theorems. See amplitude modulation for an application of the product-to-sum formulae, and beat (acoustics) and phase detector for applications of the sum-to-product formulae. In particular, the formula holds when x, y, and z are the three angles of any triangle. where Tn is the Chebyshev polynomial. For some purposes it is important to know that any linear combination of sine waves of the same period or frequency but different phase shifts is also a sine wave with the same period or frequency, but a different phase shift. This is useful in sinusoid data fitting, because the measured or observed data are linearly related to the a and b unknowns of the in-phase and quadrature components basis below, resulting in a simpler Jacobian, compared to that of c and φ. A related function is the following function of x, called the Dirichlet kernel. where atan2(y, x) is the generalization of arctan(y/x) that covers the entire circular range. The above identity is sometimes convenient to know when thinking about the Gudermannian function, which relates the circular and hyperbolic trigonometric functions without resorting to complex numbers. If x is the slope of a line, then f(x) is the slope of its rotation through an angle of −α. cos(θ+φ) + i sin(θ+φ) = (cos θ + i sin θ) (cos φ + i sin φ) = (cos θ cos φ − sin θ sin φ) + i (cos θ sin φ + sin θ cos φ). That the real part of the left hand side equals the real part of the right hand side is an angle addition formula for cosine. The equality of the imaginary parts gives an angle addition formula for sine. The factors 1, 2, 4, 5, 8, 10 may start to make the pattern clear: they are those integers less than 21/2 that are relatively prime to (or have no prime factors in common with) 21. The last several examples are corollaries of a basic fact about the irreducible cyclotomic polynomials: the cosines are the real parts of the zeroes of those polynomials; the sum of the zeroes is the Möbius function evaluated at (in the very last case above) 21; only half of the zeroes are present above. The two identities preceding this last one arise in the same fashion with 21 replaced by 10 and 15, respectively. where in all but the first expression, we have used tangent half-angle formulae. The first two formulae work even if one or more of the tk values is not within (−1, 1). Note that when t = p/q is rational then the (2t, 1 − t2, 1 + t2) values in the above formulae are proportional to the Pythagorean triple (2pq, q2 − p2, q2 + p2). for any a, b, c, d > 0. For certain simple angles, the sines and cosines take the form √n/2 for 0 ≤ n ≤ 4, which makes them easy to remember. Also see trigonometric constants expressed in real radicals. Ptolemy used this proposition to compute some angles in his table of chords. where Ji are Bessel functions.